Are you looking for a place to strengthen your child's faith in the Lord? Are you a teacher who has received the call to share your faith and love of Christ? St. Paul Lutheran is the place for you! September - May from 9:15 a.m. - 10:15 a.m.
Sunday School begins the 1st Sunday after Labor Day and we have a weekend celebration with a campfire on Saturday and Rally Day on Sunday. *For more information, please contact Nancy Thurston or the church office (810)982-9853. Ages 3 to young adult are welcome. The children meet in the Sanctuary with the Sunday School Superintendent for gathering and song before going to their classrooms. Splash Cradle is a monthly newsletter sent to your home so you can help your little one, 0-36 months, grow in Christ. Packed full of fun and inspirational activities so your growing family can share in faith together. When your little one reaches 3 years old, he or she can start attending the Splash Sunday School Class! The Sunday School classes began raising money for the ELCA Good Gifts program. 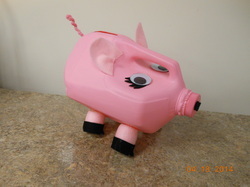 They chose to raise enough money to buy a pig for those in need. The congregation was so generous that the kids quickly set their sites on more livestock. They set a goal of getting a cow which cost $500. Update! Through the generous donations of our congregation and the Youth Group matching funds, the Sunday School children were able to purchase 1 cow, 1 goat, 4 pigs, 80 chickens, and 10 ducks for the ELCA outreach project.